I'll leave you to dwell on thoughts this image provokes. 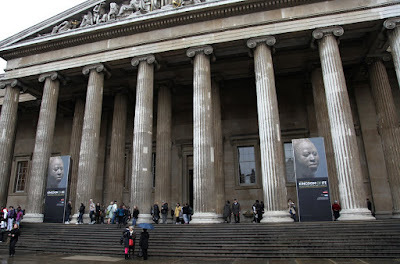 The revelation of the show is that the Ori Olokun head in the British Museum collection (and on display) is itself a copy. So, contrary to what Soyinka wrote in his memoir, we still don't know what happened to the piece that Frobenius clapped eyes on. 1. The idea that the Benin Kingdom emerged out of Ife is stated as fact. However, this story is told in mythic terms - Oduduwa's son Oranmiyan venturing east etc. I'm not sure how a mythic narrative can be used to create historical facts. Crowder himself suggests that the two kingdoms developed in parallel. 2. Benin is stated as being 'west' of Ife on one display board. This is geographically false. 3. There is no mention of Ifa divination in the exhibition. Given that Ifa mathematics was highly advanced, you'd think some context along the lines of it 'not just being sculptural excellence' would have been welcome. 4. Another board mentions the African origins of modern art and the astonishment in the 1930s when the Western world began to see the Ife pieces. Is this story itself not now an old story, or are we still at the stage where we are shocked that a Nigerian civilisation eight hundred years ago produced astonishing works of art? These gripes are mere blemishes on the surface of an incredible roomful of works, it should be noted. You would be surprised at the astonishing levels of ignorance still out there. The west likes to hold on to stereotypes of savagery and non-civilized images of Africa and Africans. Hence any notions of civilization or advancement of any sort are either ignored or swept under the carpet. Sad and true. Was it ever determined what art Picasso laid his eyes on. It's always been described as just "African". It is disheartening, all this stuff, it makes me sick, but this is what we have to live with now. My lecturer from Yabatech in Art History(Rukeme Noserime)used to gist us about this stuff but I never knew how true they were, until now.